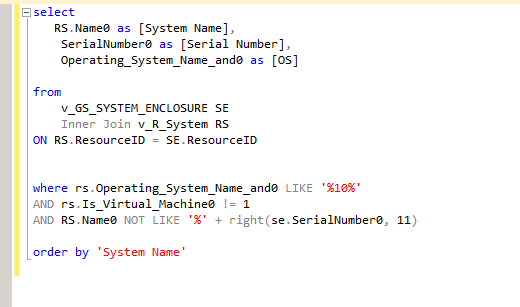 This SQL query below will do a comparison of the serial number and computer name and only show results of computers that do not match. The client utilizes the front most characters of a computer name for location codes so we used a wildcard in the "where" statement as it could start with anything, but the last characters of the computer name must end in the serial number. Now the client had some extra particulars. They wanted to exclude all virtual machines, only include machines which Operating System was Windows 10, and specifically only grab the right-most 11 characters from the serial number. HP serials are roughly 10 characters but Surface Pro 4 devices have 12 character serials. Below we used the a similar query but you'll see for the serial number we added "right(se.SerialNumber0, 11)" to have it do the comparison on the right-most 11 characters. You can change that for whichever particulars you might have in your environment such as "left(se.SerialNumber0, 5)" for the first 5 characters in a serial number and so on. You can customize this further for additional details you might like in this report such as the make/model of the device. From here you can easily add this into a SSRS report and schedule it to email the report on a monthly basis. Enjoy.